The Trinity College Dublin was developed a new library department, dedicated, as its website indicates ‘to the development of digital library collections, digital resources and imaging services to support the advancement of academic research, scholarship and education’. The new department, the Digital Resources and Imaging Services (DRIS) also includes a new Digital Collections, which provides free access to the university’s digital library collections. 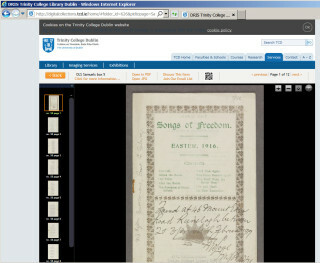 The Digital Collections, available at http://digitalcollections.tcd.ie/home/ includes over 119,238 treasures including books, maps, paintings, manuscripts and photographs. The site has lots of fantastic items, such as photographs and pamphlets, including some that relate to the revolutionary period in Ireland between 1913 and 1923. This collection (IE TCD MS 7890/8) includes photograph whose subjects include various nationalists and politicians who were contemporaries of Childers, such as Éamon de Valera, Michael Collins, Arthur Griffith, WT Cosgrave and others. Events such as one of the first meetings of the first Dáil, an Irish delegation at Downing Street, and the fire at the Four Courts in 1922 are also depicted. Also included are photographs of Childers himself as a young boy and man, with his wife and family, and other members of the Childers and Osgood families, as well as photographs of various sailing trips involving ‘Sunbeam’ and ‘Asgard’. Is a lovely little book of songs belonging to the Samuels Collection of Printed Ephemera which was donated to the College in the 1960s. It includes political ballads and songs relating to Easter 1916, such as Our Faith, and The Romance of Grace Gifford among others. This collection also includes two political pamphlets dated circa 1918, titled Arthur Griffith: a study of the founder of Sinn Fein, and Is the Irish Party Nationalist? Our policy on the parliamentary question. Items available on the Digital Collection are copyright restricted.